Talking about home battery storage can be confusing, and if you’re confused you’re unlikely to feel confident about making a big investment like a home battery bank. There are quite a few different terms & specifications that you’ll hear when shopping around for battery products. We’ve gathered them all here in attempt to bring some clarity to the often fraught endeavour of what can sometimes feel like comparing apples to oranges. –Nominal capacity: The total amount of energy that the battery can hold at a time, usually described in kilowatt-hours (kWh). Sometimes the nominal capacity of a battery is the same as the usable capacity, but not always. –Usable capacity: The amount of energy that a battery can hold after depth of discharge (see below) is taken into account, in kWh. We believe that all manufacturers / retailers should be using the term ‘usable capacity’ to sell batteries. –Depth of discharge (DoD): The percentage of the battery’s capacity that can be regularly discharged without significantly damaging the battery or reducing its lifespan. Lithium batteries can typically be discharged to 80% or 90%, while lead batteries will only go down to 40% or 60%. Flow batteries like RedFlow’s ZCell can be discharged to 100%. 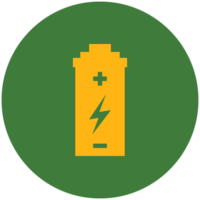 Sometimes – especially for lead batteries in off-grid situations – battery banks may be deliberately sized to have a ‘shallow’ DoD to extend their lifespan. –Maximum power: The maximum/peak amount of power that a battery can generate at a given time, for a short period (usually 3-30 seconds), in kilowatts (kW). (Read more about energy vs power batteries.) An example of when maximum power might be required is when you switch on a blender or vacuum cleaner, both of which cause a sudden surge before leveling off. Maximum output power may be limited by the capacity of the system’s inverter. –Continuous power: The amount of power the battery will generate in normal, non-peak operating conditions – the amount of power you can ordinarily expect out of the battery. Maximum output power may be limited by the capacity of the system’s inverter. –Roundtrip storage efficiency: The efficiency of charging and discharging the battery – how many kWh do you get out for every kWh you put in? For most batteries this actually varies depending on how the batteries are used (e.g. fast discharge can result in poorer efficiency), but you can usually get an average figure. Remember that this is only for the battery – the inverter will also reduce efficiency. –Cycle life: The number of charge/discharge cycles a battery has before it is considered to have reached its ‘end of life’. Some battery manufacturers give cycle life as full cycles, while others may count even a partial cycle as one full cycle. Lithium batteries will typically have a cycle life of 4,000-10,000 cycles, while a lead battery might be as low as 1,000 cycles. For lead batteries, cycle life can be extended by designing the system to have a lower depth of discharge. -Design life: Sometimes it can be unclear if cycle life refers to warrantied cycle life or design cycle life. Design life is the number of cycles/years you can expect the battery to operate in a given application (is it for an off-grid system? grid-connected system? multiple daily cycling? etc). Beware that this term is often marketing speak – a battery bank’s design life may be much longer than its warrantied life. –End of life (EoL): End of life is the point at which the battery would ordinarily be replaced. In most cases, end of life is associated with a decreased ability to hold a charge – which is why you’ll see figures like ‘80% retained capacity’. Flow batteries (Redflow) will retain all of their capacity (100% EoL), while some lithium batteries may retain as much as 90% (e.g. Enphase and Sonnen). LG Chem‘s range of batteries have a 60% EoL figure, while Tesla’s Powerwall 2 has an EoL figure of 70%. Ambient temperature range rating: Batteries are sensitive things and will not operate as well as they could if the outside temperature gets too hot or too cold. Operating outside of the prescribed temperature range may damage the batteries (thus shortening their life), reduce their efficiency or both (read more on Battery University), and/or void the warranty. Fortunately, most battery management systems are designed to keep batteries operating optimally – which means your battery may not operate if ambient temperatures go outside the bounds of what is prescribed in the spec sheet. Product warranty: This is the part of a warranty that covers all parts of the battery unit – including the cabinet/casing (if applicable) and things like the interface (e.g. LCD interface). Basically, the purpose of a product warranty is to cover everything to do with the unit. Product warranties are usually shorter than performance warranties (see below). Indoor or outdoor rating: Depending on the battery product you’re looking at, there may be a requirement that it be installed indoors, outdoors or either. It’s easier to find batteries to be installed indoors, while batteries that are rated for outdoor installation need an Ingress Protection (IP) rating. You can read more about IP Ratings here. Can you please explain this quote from above, why only if charged by the sun? Where the battery is used only for ‘solar self-consumption‘ – that is, charged only by the sun – there is no limitation set by Tesla on how much it can be used (although there would be a de facto limit based on the amount of sunshine available throughout the year). Where the battery is used for ‘any other application or combination of applications’, the warrantied energy throughput is capped at 38.7MWh (or 38,700kWh). Other applications presumably refer to things like tariff arbitrage (buy energy from grid when it’s cheap to use later) and export to take advantage of high spot market prices (where such programs are available). That works out to roughly same as what you’d get in a solar only charging scenario like the one described above – so if you’re fully cycling (charging/discharging) your battery more than once a day, you may exceed the terms of your warranty before the 10 years is up – although the battery may very well continue to operate long after that point. The point being that Tesla has designed Powerwall 2 to be fully charged/discharged no more than once per day – whether the charging source is the sun/solar panels or the grid. It’s just that with solar only charging they don’t have to set any limits because the cycling is already limited by the amount of sunlight that’s available.